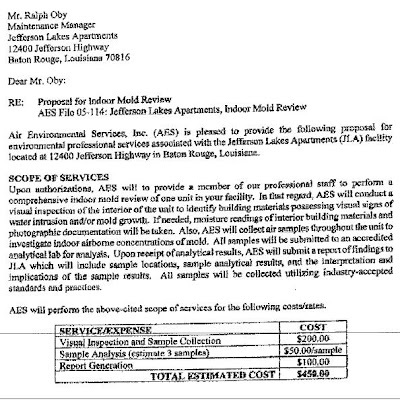 This Mold Inspection Report was performed during the time this complex was involved in a sale with the Louisiana Housing Finance Agency. My report (which will be posted soon) was done in 2005. 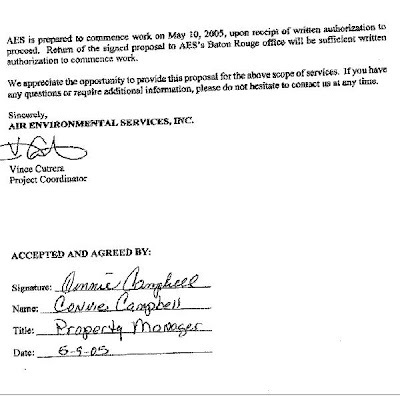 In March of 2008 a motion for summary judgement was granted to Riverstone Residential because the Judge said we did not show that management knew or should have known of this mold infestation that has been growing in these buildings for years. More on the history of these buildings and why they are so infeseted with years of mold growth to come. The Judge’s wife is the Commissioner of Administration and on the State Bond Commission that in 2007 approved the sale of this complex. My attorney had knowledge and a copy of this report. Not that we needed more proof that they had been hiding this for years and still are, but he did not mention this report in court or to me. Everything has been manipulated (illegally) to keep this from even going to court. The supoena for records from the company who did this report was for records from 2005 and three years previous to see when they had tested there before but they sent 2005 and years after. This was the same case with Guarantee Systems, they sent assorted records for 2004 and after. They have done an unbelievable amount of air and dryer duct cleaning at the complex and this too was done specifically to not provide certain information. I posted another instance of manipulation with an affidavit – yes – by my attorney – to avoid providing certain records and will repost it here. I will post my repeated questions to my attorney as to why we do not have records for the right years along with his obvious and total avoidance to acknowledge the question or respond. To find out that your basic rights can be abused by others and then abused again and then denied by the justice system and your own attorney – and all this after being exposed to that mold infested and toxic apartment (especially with a baby) is almost too much to comprehend. This is one part of the report. 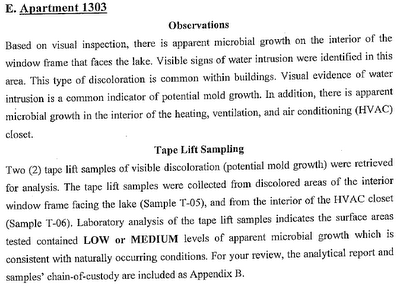 These pages show apartments that were visually inspected for mold and the results. 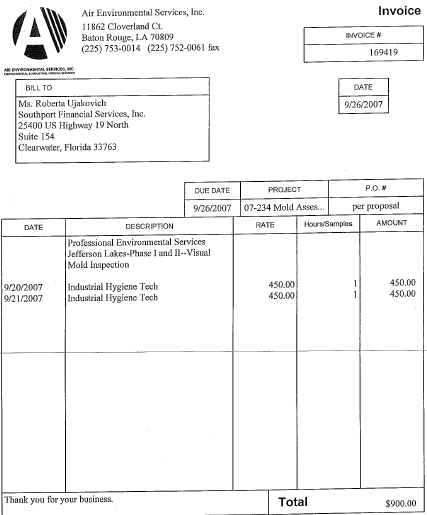 49 out of just the 76 that were actually inspected show VISUAL MOLD in the HVAC system! Riverstone Residential, after knowing of my 2005 report documenting MOLD denies that they know of mold. And they continue to say there are no reports of mold. 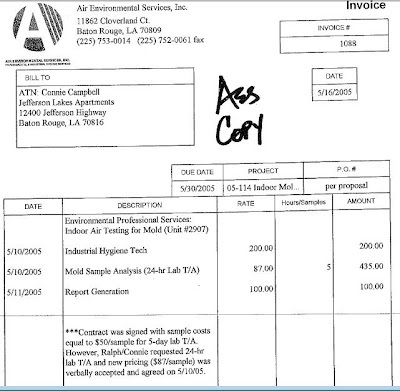 I called the The Louisiana Housing Finance Agency in 2008 and told them of my 2005 IAQ – Microbial – Fungal Report. I did not know this 2007 report was in existence at the time I called. The person I spoke with said they would certainly be concerned about a problem like this. He wanted me to send a copy of my report but I believe they are supposed to investigate reports or complaints without a very expensive professional report which most people making a complaint would not have. 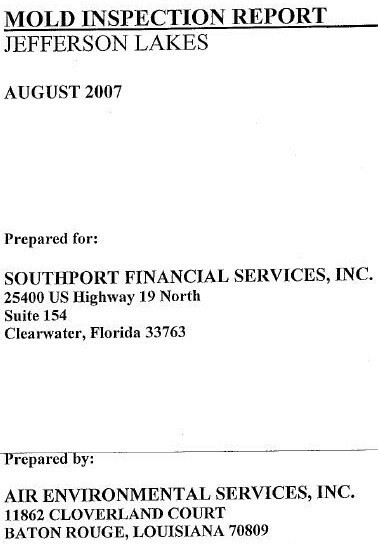 I find it hard to believe that this 2007 report was not known since all were involved in a transaction with this complex. This test was conducted in order to facilitate the identification of possible biological agents present on interior surfaces at Jefferson Lakes Apartments 12400 Jefferson Hwy. Baton Rouge, LA. 70816. 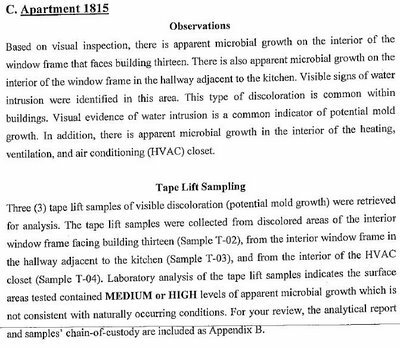 These pages from the report contain the type of testing that was done in 6 apartments in the Phase 3 buildings along with the results and recommendations. 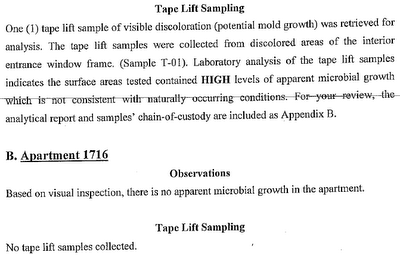 The results show HIGH levels (in 3 of the 6 and low to medium in 1) of apparent microbial growth which is not consistent with naturally occurring conditions. 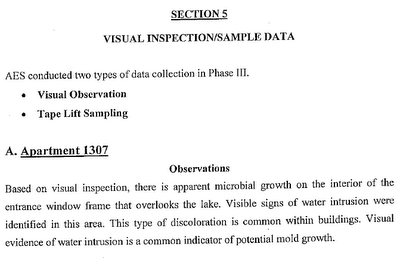 Again, as in the 49 units of the 76 inspected in Phase 1 & 2 that have mold in the HVAC system these do too. Also included are the recommendations of the visual inspection of apartments in phase 1 & 2 buildings that were posted earlier. Riverstone Residential, after knowing of my 2005 report documenting MOLD continues to deny they know of mold and continues to say no one reports mold! 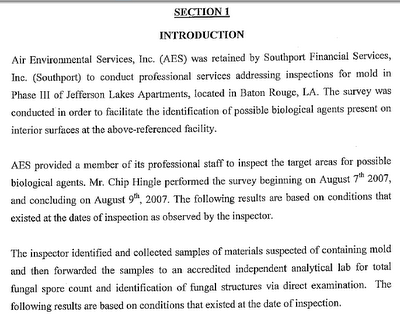 I called the The Louisiana Housing Finance Agency and told them of my 2005 IAQ – Microbial – Fungal Report. I did not know about this 2007 report when I called and it is hard to believe they did not know about it since they were involved in the sale of this complex when the report was done. The person I spoke with said they would certainly be concerned about a problem like this. He wanted me to send a copy of my report but I believe they are supposed to investigate reports or complaints without a very expensive professional report which most people making a complaint would not have. People are living there now. Years of mold growth has resulted in high levels of poisons. They still allow people to move in even with documented evidence of the TOXIC ENVIRONMENT including INFANTS and CHILDREN.